I had moussaka for the first time the other day. 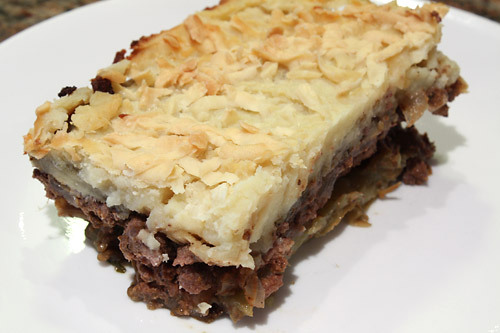 For those of you unfamiliar, moussaka is a Greek dish consisting of layers of eggplant, meat and thinly-sliced potatoes, topped with a thick layer of bechamel sauce. The flavors in the meat layer were incredible, and included some typical Italian seasonings but also cinnamon, nutmeg and red wine. Combined with a layer of tender eggplant and near-chewy potatoes, I was entranced. Despite loving the dish, I had no love for the bechamel sauce. It had hardly any flavor and a strange texture (however, I tend to despise things like custards and mayo). Regardless, I was determined to find a good recipe and alter it to my tastes. I found a decent-looking recipe here but I still needed something to replace the bechamel sauce. That’s when it hit me – since I had been meaning to make Shepherd’s Pie for a while, why not combine the two? Instead of a thin layer of potato on the bottom, I put a mashed layer on top. And not just normal potatoes, my new favorite – Korean yams! 1. Preheat the oven to 350 degrees. Place the eggplant on a greased baking sheet and lightly coat the eggplant with olive oil. Sprinkle salt on top. Bake for 20-25 minutes, until eggplant is very tender but not dried out. 2. Meanwhile, bring a medium pot of water to a boil and add the Korean yam (or sweet potato) chunks. Reduce and simmer for 15-20 minutes, or until fully cooked (a fork should go easily into the yam). Drain off the water, then mash the yams with the back of a fork. Add the milk until and mix/mash until a creamy consistency is achieved. 3. In a large skillet over medium heat, add the ground beef, onions, garlic and some salt and pepper. After the beef is browned, sprinkle in the cinnamon, nutmeg, Italian seasoning and parsley. Pour in the tomato sauce, wine, and sugar and mix well. Simmer for 10-15 minutes. Allow to cool, then stir in the egg. 4. Arrange a layer of eggplant in a greased 9×13 inch baking dish. Cover eggplant with all of the meat mixture, then cover with remaining eggplant. Top with the yam puree and sprinkle the Parmesan cheese on top. Bake for 30-45 minutes at 350 degrees, or until cheese begins to brown. I almost made this exact recipe the other night… but I ended up just mixing the meat into the sauce and eating it that way!